thiruvAimozhi – 7.8.1 – mAyA! vAmananE! In the first pAsuram, AzhwAr mediates upon emperumAn having variegated causes and effects as his wealth, and asks emperumAn “how is this!” in amazement. nIyA nI ninRavARu ivai enna niyAyangaLE! madhusUdhA – Oh one who destroys (like you destroyed madhu to eliminate the doubts of those who doubted your variegated abilities)! niyAyangaL – are under [what] principles? Oh one who has naturally amazing abilities! Oh vAmana! Oh destroyer of madhu! You should kindly explain the way you have your variegated wealth; under what principles, are you remaining in this manner with the five great elements which are the cause for the spherical universe, mother, Father, children et al and all entities which are connected to them, as your form and being the one with a distinguished form as well? AzhwAr is mercifully saying “since the causal entities are themselves present as effectual entities, bhagavAn who is the antharyAmi of everyone/everything, without being contaminated with the faults of those entities, should himself mercifully explain these confidential principles of vEdhAntham”. mAyA – This one word is the essence of this decad. madhusUdhA – Just as vAmanAvathAram is for amazing acts, madhusUdhanAvathAram is for eliminating hurdles. madhusUdhA nI aruLAy – Just as you killed madhu, you should mercifully eliminate my doubts as well. thIyAy … – The variegatedness which is seen in the effect, will be seen in cause as well. That is, each one is distinct in nature. In this manner, emperumAn is the controller of the five great elements. thAyAy … – Even the effectual entities, what is done by mother is not done by father; the help done by father is not done by the sons; the help done by the sons is not done by the relatives; in this manner, being all types of relatives. muRRumAy – Oh controller of all those related entities in the form of chEthanas (sentient beings) and achEthanas (insentient objects) who are not mentioned here! nIyAy – His distinguished form is unlike [much more glorious than] the universal form. AzhwAr acquired great knowledge that emperumAn‘s presence in paramapadham being enjoyed by the nithyasUris and his having universal form, are equally enjoyable. nI ninRavARu – The manner in which you remained with these variegated forms. ivai enna niyAyangaLE – How amazing these forms are! 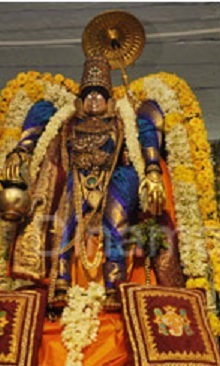 Though in the beginning itself AzhwAr has enjoyed emperumAn‘s wealth, he is enjoying emperumAn’s wealth as if he has never experienced them, just as while experiencing emperumAn’s qualities is ever fresh as mentioned in thiruvAimozhi 2.5.4 “appozhudhaikku appozhudhu en ArAvamudhamE” (every moment, emperumAn is like infinitely relishable nectar). ivai enna niyAyangaLE nI aruLAy – You should kindly explain this. Just as you cleared the doubt of arjuna as said in SrI bhagavath gIthA 6.39 “thvadhanya: samSayasyAsya chEththA na hyupapadhyathE” (none other than you are qualified to clear this doubt), you should clear my doubt as well. This entry was posted in thiruvAimozhi, thiruvAimozhi 7th centum on October 19, 2018 by Sarathy Thothathri.